Fresh seasonal fruit, fruit bread, butter and jam, Brookfarm macadamia muesli with milk, yoghurt, pastries and juice. Veggie frittata with tomato relish, smoked salmon, mascarpone and caper berry antipasto, fresh seasonal fruit, pastries, fruit toast ,butter and jam, roast tomato, rocket and avocado salad, juice. 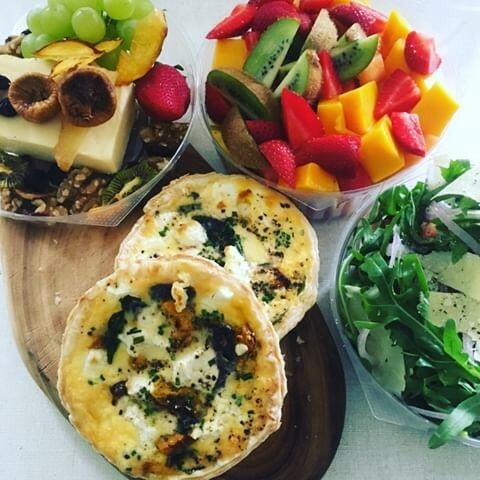 Juice, fresh fruit & yogurt plate, freshly baked frittata with relish, roast tomato salad, smoked salmon, rocket & mascarpone tart, mixed breads and pastries. Antipasto selection (includes range of olives, semi-dried tomatoes, assorted char-grilled vegetables, assorted cold meats salami, prosciutto, ham, smoked salmon -selection of tapenades). Rocket and Parmesan salad with balsamic vinaigrette. Bread basket of the day. Cheese plate with muscatels, fruit pastes (pear/quince/fig & almond) and fruit of the season. Chocolate selection & Iced Drinks. Cold Meat Selection (char-grilled chicken, rare roast beef, smoked salmon, ham); Oven-roasted tomato and onion salad; Aged Cheddar, Mustard and relish selection; olives and cornichons; Bread basket. Fresh fruit and chocolate plate. Iced drinks. Savoury Tart of the day; fresh salad with herb vinaigrette; baguette; cheese plate with fresh fruit and chocolates. Iced drinks. Smoked Salmon; Caper berry & Olive antipasto; Yarra Valley Fish Roe: Champagne; Baguette; Rolled Stuffed chicken breast with tomato concasse; rocket & parmesan salad with balsamic vinaigrette; char-grilled vegetable & goats cheese terrine, nougat, fresh fruit plate; chocolate hearts or fruit flan. ·We can make up a delicious Mezze platter. Fresh selection of sustainably farmed meats, charcuterie and Salumi salami products, boutique cheeses and a delicious range of sweet treats.